My favourite month is coming to an end. There are three main reasons why I love July: summer weather (I'm in Canada), my birthday, and yes, of course, fresh RASPBERRIES! Baby Guillaume is almost 8 months old and has been enjoying this seedy fruit for 3 months already. I want to share some ways now to introduce fresh seedy fruit like strawberries or raspberries to your little one's palette. Watch the video above to see tools I use and for quick instructions. 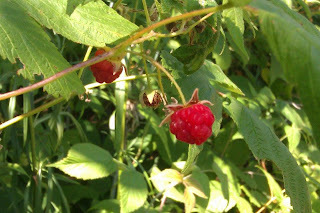 The wild raspberries picked in my yard today yielded about 1/3 cup of juice. You can also use the mesh strainer method for blueberries let's say if you want to reduce your child's insoluble fibre intake and increasing their digestability (to save time, it is best to puree bigger fruits prior to straining). The resulting puree is silky smooth, seedless and antioxdantly nutritious ; ) There are no preservetives so you'll want to consume it promptly or freeze. Add it to a pureed apple, banana, mango or cereal for your baby's raw breakfast or sweet treat after something more savoury. A toddler would love this too, as would likely anyone else instead of jam or in a smoothie. Dilute with water in a sippy cup. Your baby does not need to know sugary drinks exist just yet! Let him/her discover whole food tastes firsts! Mix in with store-bought applesauce or plain yogurt to add raw goodness to processed foods. My eco tips today have to do with avoiding waste. Raspberries are small but packed with good stuff so you don't want to waste more than you will already be throwing in the compost bin with the seeds. 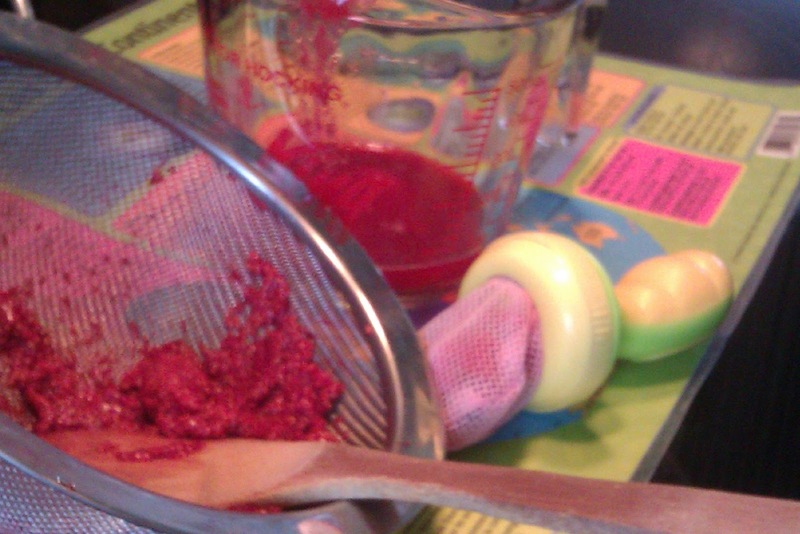 First, ensure you scrape the bottom of your strainer to catch all juice. Then, when you've transferred the puree from bowl or measuring cup to the serving or freezing recipient, rinse, pour the tinted water into a sippy cup or bottle, refrigerate and serve to your child instead of plain water or add to YOUR homemade iced green tea or lemonade.